Surya Power Company Pvt. Ltd.
Surya Power Company Pvt. Ltd. Market leaders in designing, suppling and installing solar home system for residential/commercial application. Surya Power Company Pvt. Ltd. is an international organization that designs, supplies and installs solar home system for residential/commercial application. they are a one-step provider of individual components, complete systems as well as expert to provide a complete turn-key solution for your power needs. They are the distributors/ reseller of major market leader solar products manufactures. Distributors/ reseller, market leader, Solar products manufactures bringing the latest technologically advanced products to serve you better. The company has presence in Bangladesh, Singapore and Australia making in roads to other Asian countries and is focus on providing environmentally sustainable solutions to you . The company is also exploring other means to promote solar power in the world. Solar power system will help reduce your bills, Government Subsidy* ( not applicable for urban areas at this time), Produce clean electricity and reduce the impact of pollution and greenhouse gas emissions. Installing a solar power system helps you to meet energy requirements. 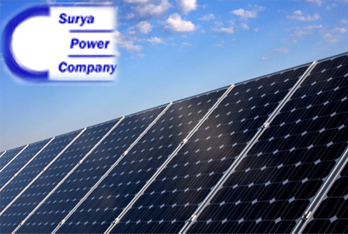 Surya Power Company's vision is to be the dominant player in installation of clean energy in Asia.